I have seen only the anime and not the manga. I am utterly curious about the ability and power of Saitama. In the starting episodes, he mentions that he trained very hard and also details his training regime. However, I am still curious to know: is there any mention of the source of his enormous power somewhere in the Manga? The anime version of One Punch Man is really accurate on regard to the manga so nothing has been revealed in the manga that hasn't in the anime. As a result, Saitama loses his hair, and becomes incredibly powerful. This training is the source of his power. Keep in mind that One Punch Man is intended as a shonen parody as it is making a parody of its codes. In a lot of shonens, training is a main part of the manga. As an example, in Dragon Ball, the sayans spend years in the Hyperbolic Time Chamber in order to become stronger. By making the training of Saitama so simple (compared to the heroes capacities), One Punch Man is making fun of this Shonen code. Therefore we may not expect any more explanation on what Saitama did in order to become stronger. Out of universe (aka, in the real world), OPM is definitely a parody of seinen and superhero stories (Power Rangers type stuff, in particular), especially at its inception. So his power simply is, and serves to parody the aforementioned genres, as indicated in HamtaroWarrior's answer. He is just the hero that shows up to vanquish the monster at the very end of the story, only in this case he doesn't do it for Love or Justice or any high ideals like that. 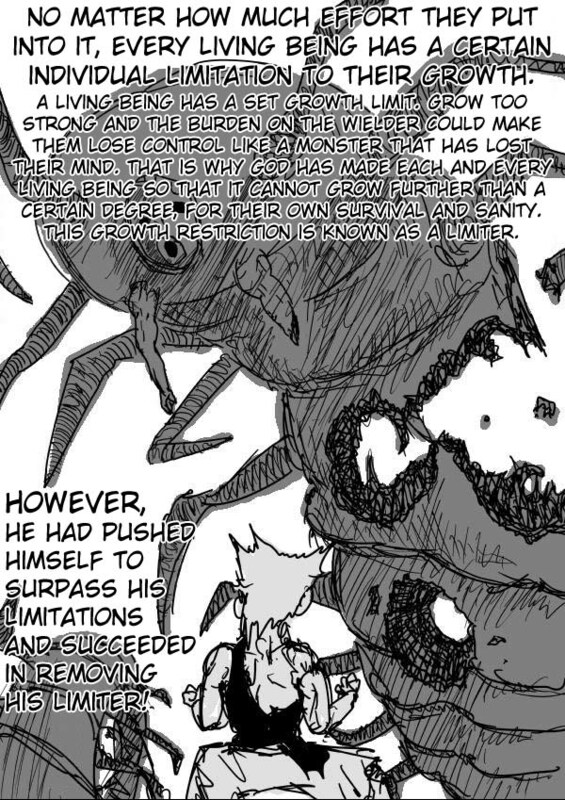 The following is Dr. Genus speaking to Zombieman about why he has given up on the House of Evolution--Saitama made him realize it was futile, as all he would ever do was raise the limits of humanity, which could never compete with something without limits. There are a few panels before and after this one that continue to discuss Saitama's power. Go read the rest of the chapter for them. The manga is not quite this far along yet, but it's not terribly far away, and there are some things in the manga that are not in the webcomic (see the image and surround text below, for example). Someone who is already in decent shape will not be fazed much by Saitama's exercise routine (see HamtaroWarrior's answer). Their biggest problem, if any, would be the lack of rest days. However, people in bad shape would take to it much differently. I know in my current couch-potato state I'd have a lot of trouble with jumping straight into that kind of routine, and would likely inflict several long-term injuries on myself from muscle pulls etc. I've basically done so in the past, actually. Years ago, when I was a scrawny little nerd who never really exercised, I suddenly decided to try to get some muscles and tried getting 100 push-ups done total throughout the course of a day (2 here, 10 there, etc.). I pulled a stabilizing muscle around the spine and shoulder blade. I collapsed face-first onto the floor with a scream when it happened. For a few days I had limited use of one of my arms and spent most of my time in bed (which was still painful--you never really stop trying to use a stabilizing muscle, thanks to gravity), and I had painful muscle spasms in that area for many years. Saitama was probably in better shape than that when he started, but he wasn't in particularly great shape either. He was just a lazy, unemployed lay-about, after all. I would expect him to be pretty firmly on the side of "doing this every day will lead to injuries and a lot of pain" when he started training. The manga adaptation has a sidestory about Saitama's training days that shows him powering himself past intense pain, actually. It's worth noting that the pain was from a bad tooth, not his training. He was already in his 300th day of training during this story. Once the tooth was knocked out he felt fine, but before that he's in great pain and continues his workout and saves a few people along the way regardless. There's another sidestory early on about his training days, but doesn't go into what pain he may have experienced in the early stages. The anime adaptation of the scene from Hamtaro's answer includes a brief clip showing Saitama in pain while training, though. 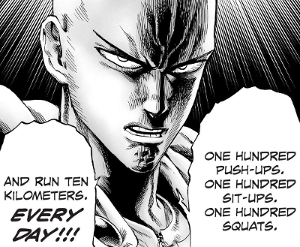 Saitama essentially always trained beyond whatever his limits were--if he suffered an injury like I did, he would havewilled himself past it and continued to do 100 pushups and everything else every single day regardless. For the record, this is a really bad idea in real life. Please don't do it. Exercise programs and such should be taken seriously when they tell you to consult with a doctor before starting any exercise routine. *Or you can now see chapter 88 of the manga ("88th Punch: Limiter") for essentially the same exposition. Be careful if you go looking for this online, though. This series is notorious for having completely different numberings according to different people/sites, to the extent that some sites still have certain earlier chapters out of order. I see this chapter in question listed as chapter 135 in one location, for example. isn't the explanation of his powers tied to the universe it's self? the crab monster eating too much crab, the custom car guy becoming a custom car. before he kills the crab guy he even says he wanted to be a hero not a businessman, a hero who could send scumbags like crabman flying with a single punch. add all that together and then pay attention to the scenes where his eyes glow with intensity and I think you have the answer. now why those powers form from the obsessions/desires I don't know but I think his powers come from his deep desire or obsession with wanting to be a hero + the universes ability to grant powers to people. I think his powers come from his intense desire to be an all powerful super hero. He wants to be the strongest there is and so he sets himself what he sees as an intense workout program and unlocks his power and assumes it came from his workout regime. I also see Saitama as a parody not just of manga characters but also as an homage and parody of the Superman from the 60's and 70's. That Superman was so overpowered that he literally could defeat anyone who came against him without breaking a sweat. It became hard for DC comics to have him fight villains because of just how powerful they had made him. They usually had the villain resort to tricks or hoaky scenarios to weaken Superman so he could be fought. He was essentially a god not a hero and he could have beaten anyone with just one punch. If you look at the anime you can almost see Superman in the way Saitama moves at times in his costume and the way the cape flutters and moves. Even Saitama's costume is more of an American style costume than a Japanese style. Does Blast appear in the manga?